Do you often have a bite of a tomato and wonder why you even bother buying them? 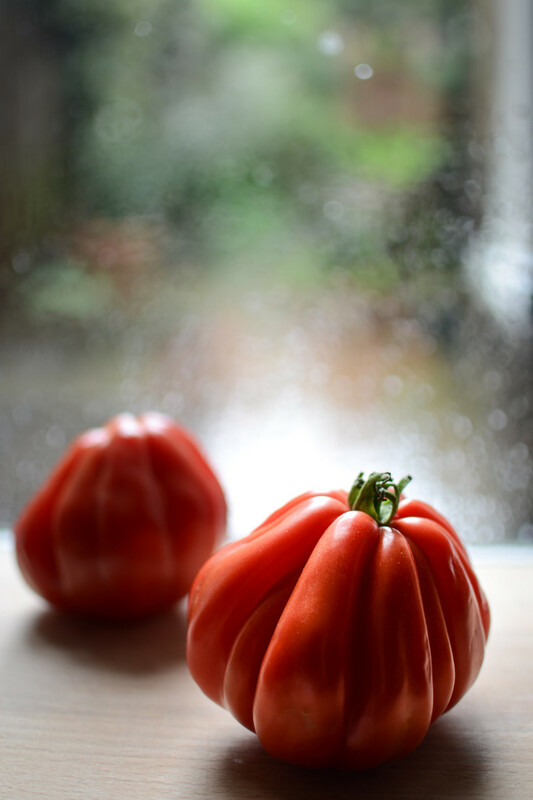 Although beautifully uniform and bright red, commercial tomato varieties often lack taste. One of the reasons for this was the move by tomato growers in the 1930’s towards tomato mutations with a “uniform ripening” gene, which ensured the fruits would ripen evenly from stem to tip, without leaving a harder, green part around the stem, deemed undesirable by consumers at the time. Unfortunately this mutation has a side-effect: by disabling the gene that creates the darker green colour around the stem, the chlorophyll (or chloroplasts), which converts sunlight into sugars for the plant, is removed, leading to a less sweet and tasty fruit. Thankfully some families and growers have passed the seeds from older varieties down from generation to generation because of their valued characteristics and taste. 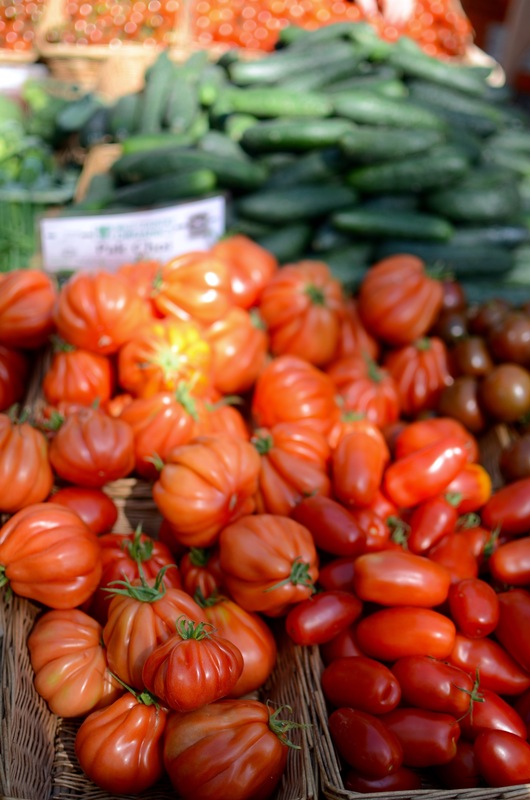 These heirloom varieties – now available at most markets – are usually much more tasty, albeit a little more expensive. We’ve had a few very wet days lately, which meant the wonderful summer produce I bought at the market over the weekend had to find a rather more wintry purpose. 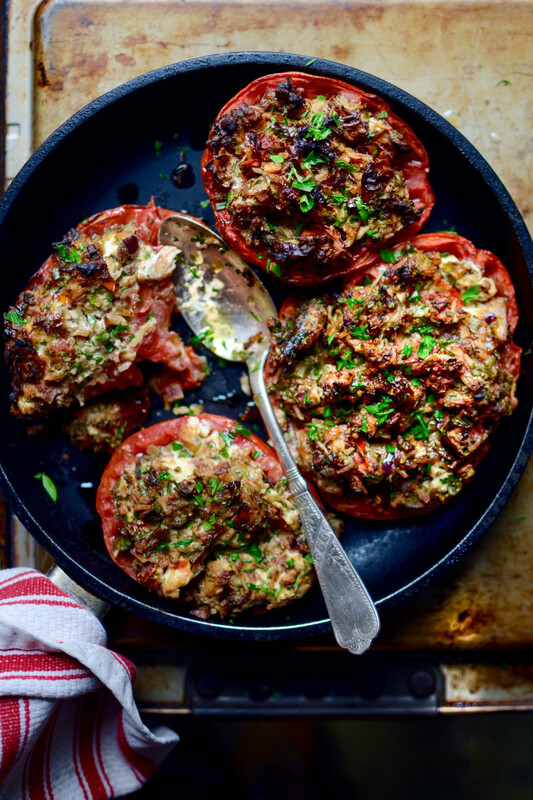 I’ve always loved roasted tomatoes, but stuffing these beauties elevates them to the most perfect light meal imaginable. If you cannot find heirloom tomatoes for this recipe, use 4 large regular tomatoes. For the oven-roasted cherry tomatoes, cut 2 punnets of cherry tomatoes in half, toss in red wine vinegar and olive oil, season with salt and pepper, then roast cut sides up in a medium hot oven until caramelised (about 1 – 2 hours). I usually have a jar of these in my fridge, but you could also replace them with 60g of finely sliced marinated sun-dried tomatoes and increase the amount of rice slightly. 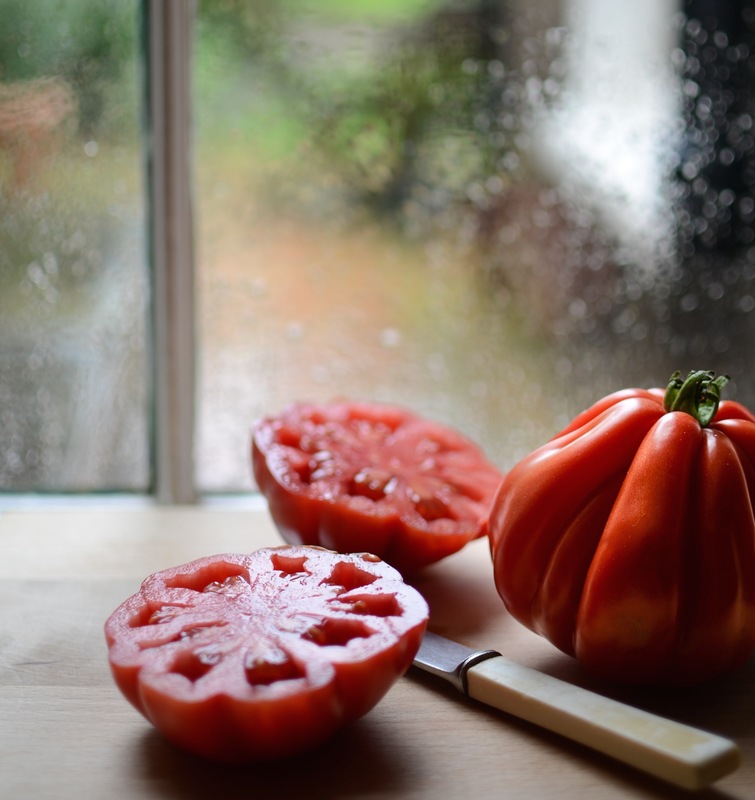 Use the scooped out tomato flesh in your next batch of tomato soup or sauce, or blend with a pinch of salt and strain through a muslin cloth to make the most delicious tomato broth. Pre-heat the oven to 180°C/360°F. Heat a glug of olive oil in a saucepan over a medium heat. Add the onion, celery, salt and dried herbs, and cook until softened (about 5 to 10 minutes). Now mix together all the ingredients for the filling, except the ricotta, and allow to cool. Fold the ricotta into the filling briefly, leaving it in tact as much as possible. Spoon the filling into the tomato halves, place into an ovenproof dish that fits them snugly and bake at 180°C/360°F for about 30 to 40 minutes (or until the tomatoes are very tender). If the filling is starting to get too brown after about 20 minutes, cover with foil. Serve with a crisp green salad and green beans, or on toasted sourdough.